Generally we think of it happening when rabbits have dirty bottoms, but that doesn’t always have to be the case. 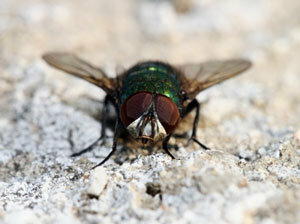 Blowflies (bluebottles and greenbottles) can lay their eggs anywhere on a rabbit’s body. The eggs are tiny and hard to spot and they are laid deep in the fur so that makes it even trickier! Owners should examine their rabbits at least once a day, especially in warm weather. The flies will lay eggs anywhere they smell blood or dirt, so wounds are a target, but dirty or wet bottoms are the usual place to find the problem. Rabbits with a poor diet, that are overweight or have mobility problems are most often at risk. . Check your rabbits’ diet is high in fibre and low in carbohydrates. This means the main food should be hay or grass and they should eat about their own size in this every day. They should also get a small amount of leafy greens and an eggcup full per rabbit per day of nuggets. If your rabbits are at risk then treat them with Rearguard. This is applied to your rabbit’s body every couple of months. It inhibits the development of maggots from fly eggs. This product can be used if your rabbit is at risk of flystrike, as recommended by your vet. Insect repellents/insecticides containing Permethrins can be used, to deter and kill flies, but always take your vet’s advice on such treatments, to avoid using those which contain Fipronil, which is toxic to rabbits You can’t rely on this alone, you still need to check your rabbits daily. Don’t wash your rabbit. Your vet will need to clip the fur and wet fur is almost impossible to clip. Pick off any maggots you can see but don’t let that delay you getting your rabbit to your vet.